CSynth was at this year’s Cheltenham Science Festival, one of the UK’s biggest science fairs, offering six days of debate, discovery, experiments, enjoyment and hands on fun that allow the public to explore the latest scientific research. 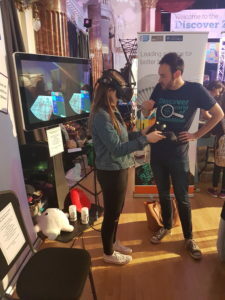 CSynth was part of the folding genome stand, using virtual reality to engage the public with the concept of DNA folding, and how this process can go astray in certain diseases. During our three days at Cheltenham Science Festival we interacted with over 1,000 people, engaging a variety of public, from young children to pensioners.